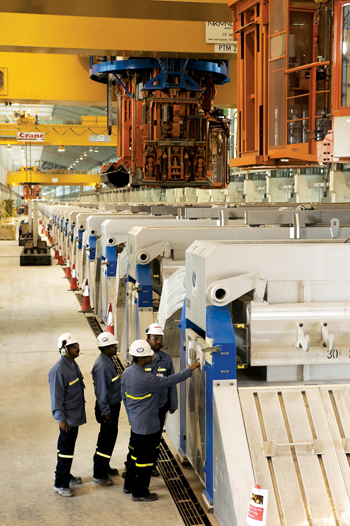 Qatar Aluminium (Qatalum) has automated its pot cover handling task, resulting in shorter atmospheric exposure times, increased safety and reduced emission. The company also announced that an audit with extended scope has confirmed its primary aluminium and Casthouse products are in compliance with a standard deemed a prerequisite for supplying products to the automotive industry. “Of all the tasks done with the pot tending machines (PTM), one particular task is the removal and placing of the pot covers during the anode change and anode covering task that shield the exposed portion of the pots. All the PTM’s at Qatalum are fitted with a dedicated cover handling unit. Qatalum is the only smelter in the world practising semi-automatic cover handling. The advantages of this are two fold, increased safety and reduced emissions,” said a company statement. Simply stated, the lack of human interaction on the potroom floor avoids accidents. Additionally, in Qatar’s hot conditions it also avoids employee exposure to over 50 degree C working conditions. Instead, the whole anode changing process, of which cover handling is one, is executed by a single operator sitting in an air conditioned PTM cabin. Emissions from pots are drastically reduced when a pot is covered. At Qatalum, when covers are removed to facilitate an anode change several factors come into play. There is an inbuilt suction process that is tripled creating a negative atmosphere within the pot. All emissions and dust are sucked into the filtration system creating a dramatically cleaner local environment. Emissions measured from the potroom roof at Qatalum are currently measured at 0.15 kg of fluorides per tonne of aluminium produced – the lowest in the business and directly associated to cover handlers and the fume suction process. Meanwhile, a third periodical audit at Qatar Aluminium (Qatalum) has confirmed that its ISO/TS 16949 quality management system implemented in the production of primary aluminium and Casthouse products (extrusion ingots and foundry alloys), is in compliance with ISO/TS 16949:2009 standards, which is a prerequisite for supplying products to the automotive industry. The audit however, did identify minor nonconformities, two in the potlines, two in extrusion ingot production, one in raw materials and one in purchasing. All six identified nonconformities will have to be effectively closed by the 3rd of May 2014. The audit, carried out by external certification body Det Norske Veritas, took place at Qatalum early last month and was different from past audits as further to covering foundry alloys production it included extrusion ingots and liquid aluminium production. “During the audits closing meeting, the auditors expressed a positive opinion about the Qatalum ISO/TS 16949 quality management system’s development since initial certification of foundry alloy production in February 2012. Based on this experience from the Casthouse which has been working with an ISO/TS 16949 standard since 2011, Qatalum can expect similarly positive effects by using ISO/TS 16949 standard in the other areas added to the ISO/TS 16949 certification scope,” the company said.